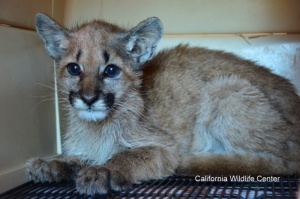 They were once malnourished, fearful and full of parasites, but now these former SoCal two mountain lion cubs have grown into strapping young cats ready for the world ahead of them, a world that doesn’t involved being poked at with sticks by strangers on the streets of Burbank. Found in December of 2011 under a parked car in Burbank (where residents were thrusting broomsticks at them to shoo them away), this feline duo “was rescued just in the nick of time,” says curator Katelyn Cottle of Zoo to You, a conservation educational facility in Paso Robles. 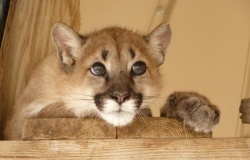 Olive and her brother Leno were rescued in the “nick of time.” Photo couresty of the California Wildlife Center. 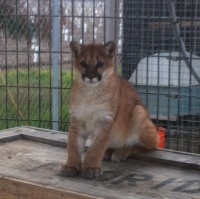 The 3-month old cubs were only 9 and 11 pounds when they arrived at the facility a little more than a year ago. Now, they are packing in between 75 -80 pounds, a more adequate weight for carnivorous cats. Olive — in between cub and cat. Photo courtesy of Zoo To You. They were first named Olive and Magnolia (Burbank streets, dontcah know) until it was discovered that Magnolia was a boy. Now known as Olive and Leno (yes, after Jay Leno whose Tonight Show tapes in beautiful downtown Burbank), the not-so-cubby cats spend a good chunk of their days working with trainers and resolving trust issues. It’s hoped the duo will become traveling educational ambassadors, taking the mantel from the facilities’ two other “elderly” cougars that are 15 years old. Olive growing up. “What? I’m not in Burbank anymore?” Photo courtesy of Zoo to You. Consider the plight of the three trainers who work with the cats – everything is positive reinforcement which means praising and acknowledging good behavior and totally ignoring bad behavior. “So when the cats, claw or bite you, you just have to ignore it. You can’t react when they do that,” says Cottle. “That can be really hard to do when they are in attack mode.” Soon, the cats will realize they aren’t “getting a rise” out of the human and decide to do something else…something that may get them a treat or other goodies. Training Olive. Always positive reinforcement. Photo courtesy of Zoo To You. 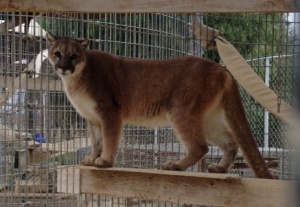 Scientists have DNAed the duo’s mother and father as part of a small contingency of mountain lions that live in and around the Verdugo Mountains near Burbank. Camera traps in that area snap and record wildlife; researchers were excited about a video recorded only a few weeks before the cubs were discovered in Burbank. They thought the images were of the brother sister pair. The Department of Fish and Game (DFG) estimates that there are between 4,000 – 6,000 mountain lions in California; they are not endangered, but they’re considered a “specially protected species” and cannot be hunted. 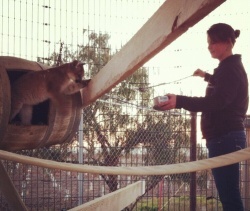 Mountain lions are the ultimate boogie-man of urban predators. They are painted as the vicious creatures that stalk the shadows for hikers on the trail, children in playgrounds, old people at the bus stop, or pampered pets in backyards. However, a DFG record of mountain lion attacks in the state of California reveals that since 1890, only seven people were killed by mountain lions and 16 nonfatal incidents were reported. Yes, you are more likely to hit by lightning twice then be attacked by a mountain lion. Mountain lions are not the blood-hungry cat of our collective human nightmare; in truth they are solitary hunters, elusive and shy. They don’t hang out in prides and only meet up with others of their kind for mating. They want to be left alone and far away from humans as possible. Still urban and rural folk need constant reminders that the big cat is not their enemy. The folks at Zoo to You are sure these two mountain lions – which have garnered a lot of public sympathy and local fame – offer a unique chance for conservation education. Anyone can see the pair when they visit the center which is only a few hours away from the Los Angeles area. Having a pair of wild cats with a dramatic backstory may soften the hardest of hearts and allow their real identity of the mountain lion to shine through the fear. Olive today. Not a scrawny cub anymore. Photo courtesy of Zoo To You.